Recamier Range, Syracuse - stunning new pattern from Robert Haviland and C. Parlon. Inspired by the Greek motifs of Syracuse - described by Cicero as the greatest Greek city and the most beautiful of them all. 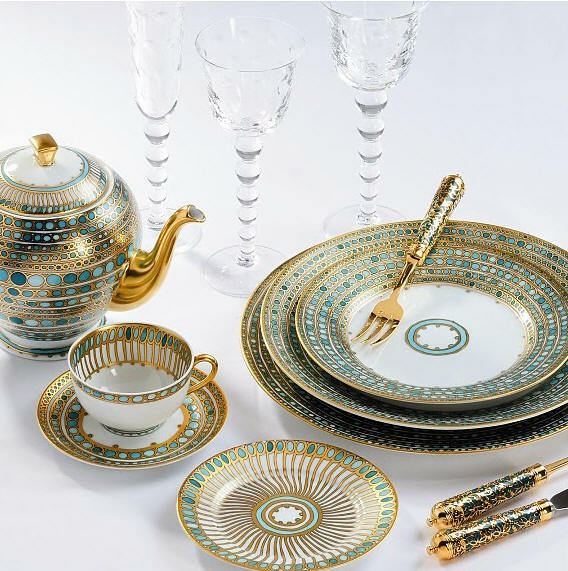 Syracuse is once of the designs of Arielle de Brichambaut, French artist and dinner service designer. Syracuse is an interesting combination of the Recamier and Chine ranges, the teapot/coffee pot, creamer, sugar bowl, breakfast cup and teacup are all Chine whilst the rest of the range, including the coffee cup, is in the Recamier shapes (View shapes for Syracuse) We also have an additional page dedicated to Syracuse pictures.